Fishing boat for sale. 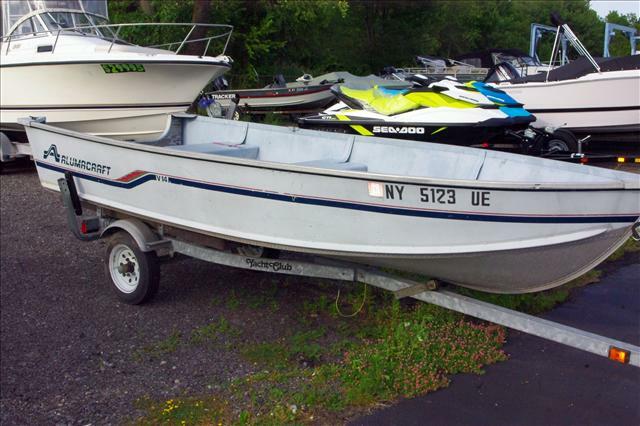 Comes with a '87 trailer (title in hand) 8 HP Mariner outboard motor was fully serviced last year and runs great. 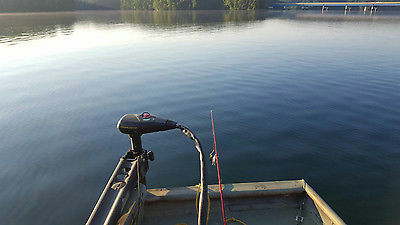 Has 2 interstate batteries in and a bow mount minn kota trolling motor. Boat has no leaks cracks or major damage and is ready for the water. If I get full asking price I will put brand new tires on trailer they are almost shot and should be replaced. 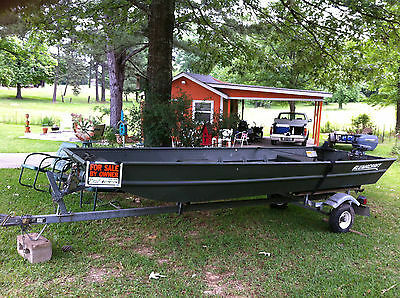 Fishing boat for sale. 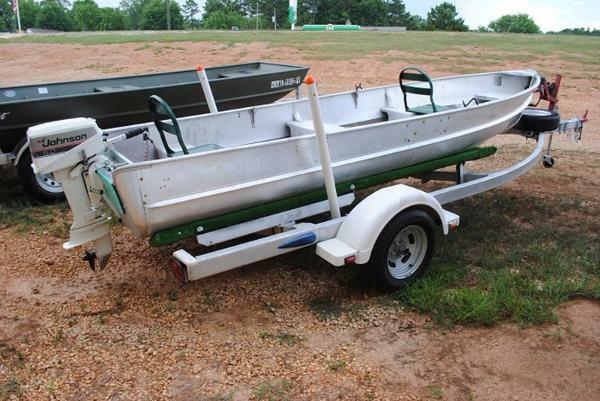 Comes with a '87 trailer (title in hand) and a 8 HP Mariner outboard motor. 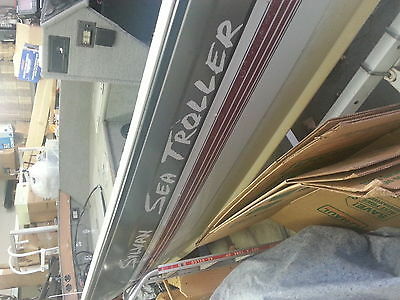 There is also a trolling motor on the front of the boat. Motor runs good. 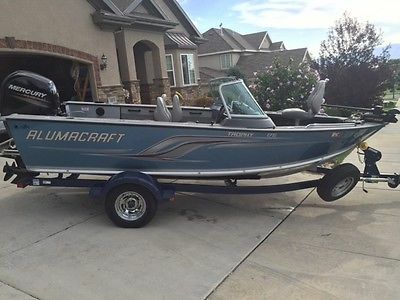 1989 Alumacraft Fishing Boat LV14, 1989 Alumacraft V-14 fishing boat. Powered by a 1990 Mercury 9.9hp Two stroke outboard. Trailer included. Three bench seats. Gas tank and hose included Outboard motor runs great. 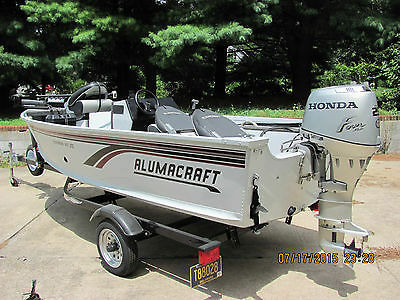 2016 Alumacraft Fishing Boat Tournament Pro 185 Sport, Arriving Soon! 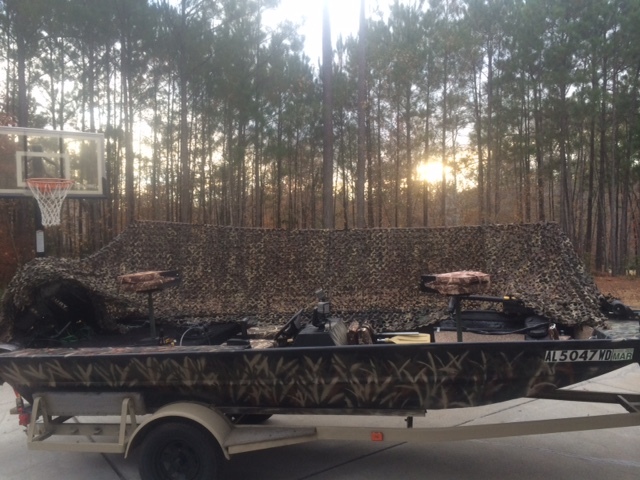 2016 Black / Copper / Black Alumacraft T-Pro 185 with the awesome new Yamaha V-MAX 150hp 4-Stroke and trailer. Length 18' 3" 5.6 m Beam 97" 2.5 m Transom Width / Height 96"/25" 2.4 m/0.6 m Max. Horsepower 175 hp 130 kW Max. Depth 43" 1.1 m Max. Hull Thickness 0.200" 5.1 mm Freeboard Thickness 0.080" 2 mm Weight 1,680 lbs 762 kg Max. Capacity 6/1,600 lbs 6/726 kg Fuel Capacity 34 gal. 129 L Livewell Aft 18 gal. 68 L Livewell Bow 18 gal. 68 L Instruments speed, tach, volt, fuel, horn Seats 3 w/ air ride pedestals STANDARD FEATURES Interior Courtesy Lights Tilt Helm Gauges - speed, tach, volt, fuel Horn Hydraulic Steering Lockable Glove Box Trolling Systems - 36 volt Driver's Seat Slider AlumaTrac System Folding Cleats Grab Handles Auto Bilge Pump Dual Aerated Livewells with Timers Manual Bilge Pump Stowable Running Lights INSTALLED OPTIONS: Yamaha Fuel Separator Kit Travel Cover USB Auxilliary Stereo Input All Vinyl Interior V MAX SHO? Performance just got leaner and meaner. Meet the exciting new 2.8L I-4 V MAX SHO 150 with 25-inch-shaft. The streamlined design conceals a next-gen tech package with a 16-valve double-overhead cam, variable camshaft timing and electronic fuel injection. In other words, it delivers the exhilarating hole shot and top speed of a two stroke with the efficient advantages of a four stroke. At just 480 pounds, they?re ideal for smaller bass boats, flats boats and other performance hulls. The all-new 2.8L I-4 V MAX SHO 150 features: Greater Versatility The I-4 V MAX SHO 150 now includes Yamaha's Variable Trolling RPM Switch (VTS?) and offers the option of a 25-inch shaft. It is the ultimate outboard for anglers trolling for walleye, salmon or trout on multi-species boats. Faster Top Speeds The VF150 is several mph faster than comparable four-stroke competitors. Quicker Hole Shots At a mere 7.7 seconds, the award-winning VF150 has a hole shot on par with the two-stroke Yamaha VZ150 and up to 4.1 seconds faster than some four-stroke competitors. Smarter Fuel Economy The V MAX SHO 150 delivers the incredibly efficient, clean and quiet performance you expect from a four stroke. Using up to 40 percent less fuel than a traditional carbureted two stroke, the savings alone should be enough to get you on board. Ample Charging The 2.8L I-4 V MAX 150 SHO features a 50-amp alternator, providing plenty of power to accommodate a range of on-board electronics. Rigging Convenience Uses mechanical controls, so is a perfect repower option for bass, bay and flats boats, and is compatible with analog, 6Y5 digital or Command Link? gauges. 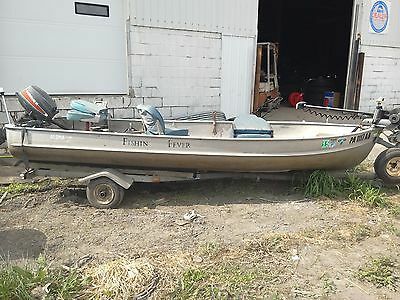 14 ft aluminum fishing boat with trailer, like new. 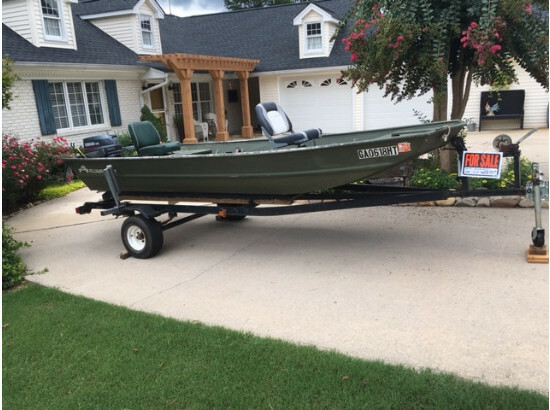 Lightly used 14ft boat comes with trailer, trolling motor, battery, mini cota trolling motor, and fish finder. 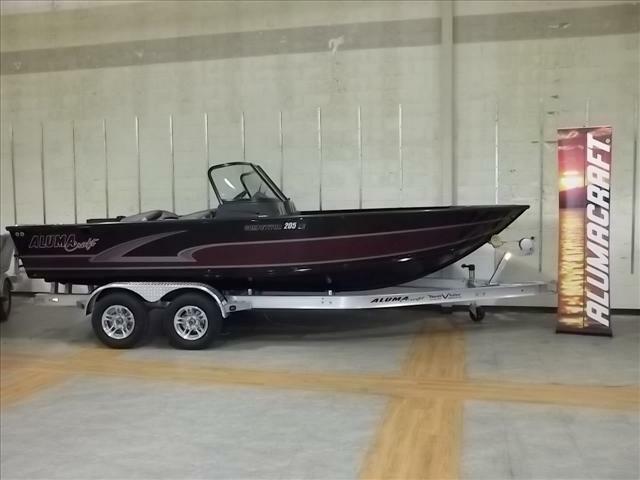 Perfect for fishing or going out on the lake/water. Ask me any questions. I am willing to deal a price. Just message me.